A standout collection, this time from Dice Kayek another fairly new name. Co-founder and creative director Ece Ege was clearly obsessed by volume and layers. 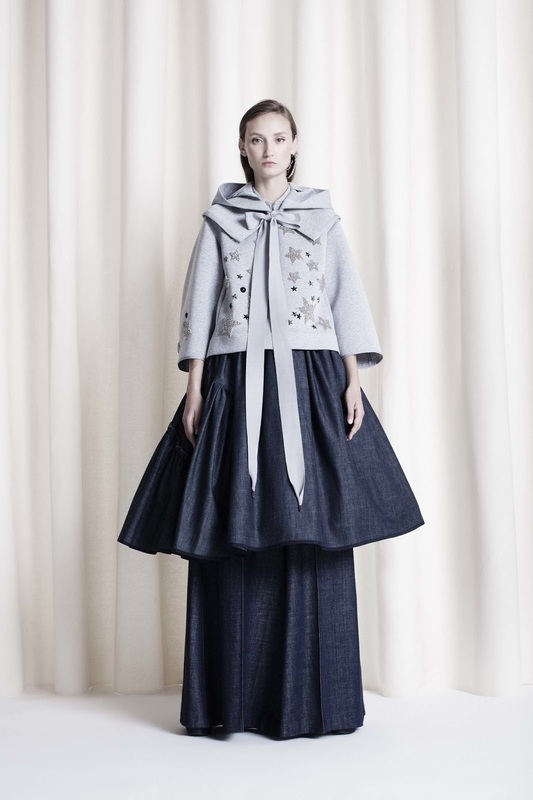 He rendered asymmetrical tiers, pleats and ruffles in denim and Swiss cotton delicately threaded with pearls. 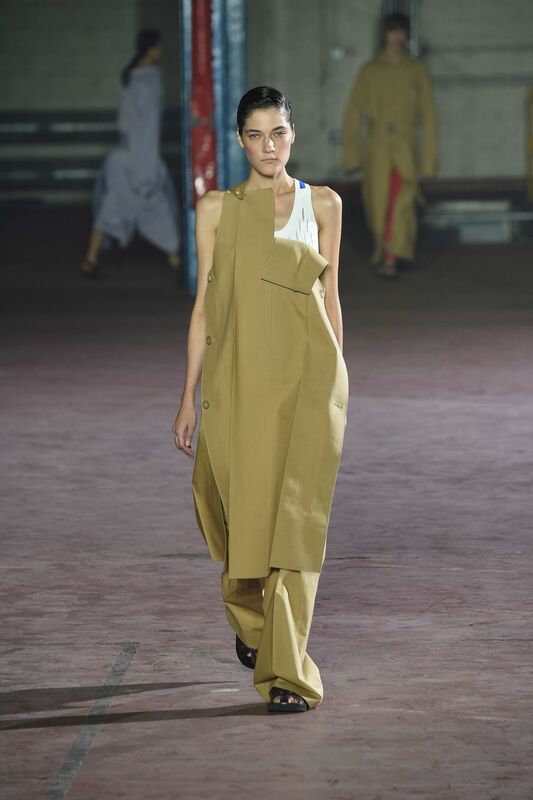 We aren't always fans of Margiela, but we liked this somewhat inconsistent collection full of unusual shapes and textures. Deconstructed elements including raincoats that had been turned inside out, a neoprene wetsuit peeled to the waist to become a skirt or a chunky sweater-turned-shawl were clever touches. After a slow start, Paris Fashion Week is up and running with shows from all of the usual suspects. We have decided to start with a less familiar name: Toni Maticevski, the Australian designer who is perhaps better known for his bridal gowns. His collection for Spring featured highly sculptural and well-crafted garments. Maticevski manipulated traditional fashion silhouettes to create feminine shapes that were a wonderful fusion of art and fashion. Another vast collection from Milan and another one of several Italian collections that have their eye on the tropics for Spring. No great departures from the House's usual aesthetic in terms of overt Italian references and, in particular, references to the South of the country. This time however Dolce + Gabbana appeared to poke fun at the usual stereotypes and tropes found in Italian culture: a pizza advertisement was used on a minidress, gelato and various shapes and kinds of pasta formed the print on several dresses, while fish and flowers fought for equal billing on yet others. Of course everything was overwrought with embellishment but this was often tempered by the addition of a simple logo t-shirt. 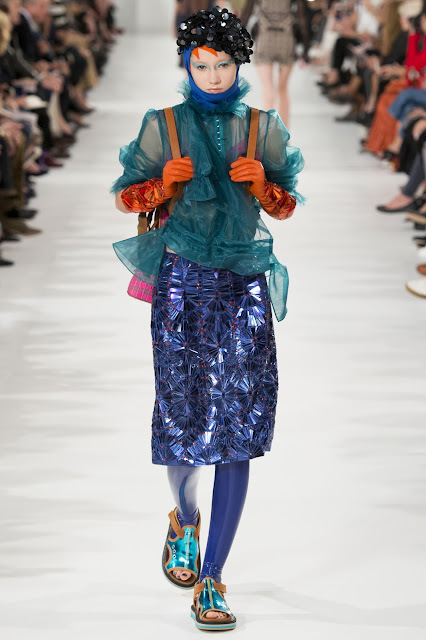 Our favourite looks were the ones that incorporated oversized, multi-coloured metallic paillettes on coats and dresses. A collection that reflected a lightness and old-world glamour from Ermanno Scervino where embroidered lace or silk organza dresses were adorned with flowers and topped with military velvet devoré jackets. 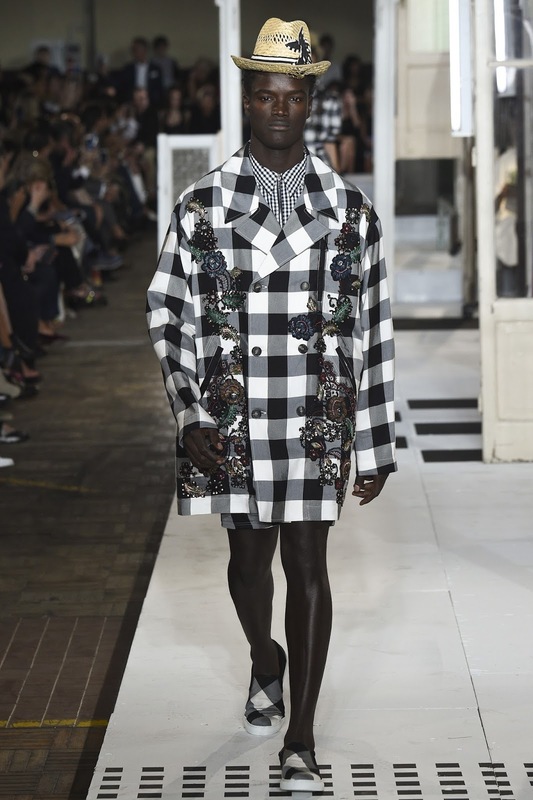 A huge collection from Antonio Marras who showed more than 70 pieces in this collection that was inspired by Malick Sidibé’s photos of nightlife in Bamako, Mali in the 1950s and 1960s. Marras opened the show with denim pieces and Shibori prints that were layered and patched with dévoré lace. The next set of clothes were based around a gingham print that was mixed with coordinating florals and embellished with rose embroideries, raffia flowers and recycled metal pellets. The looks that closed the show included reconstructed, surplus Italian army parkas and other hybrid prototypes that had been made during the creation of the collection. The Italians seem to be enamoured by a rustic view of the countryside (also see Daniela Gregis) embodied by Blumarine's collection. Designer Anna Molinari sent simple but structured day dresses in muted tones of green, earthy brown and blacks down the runway. 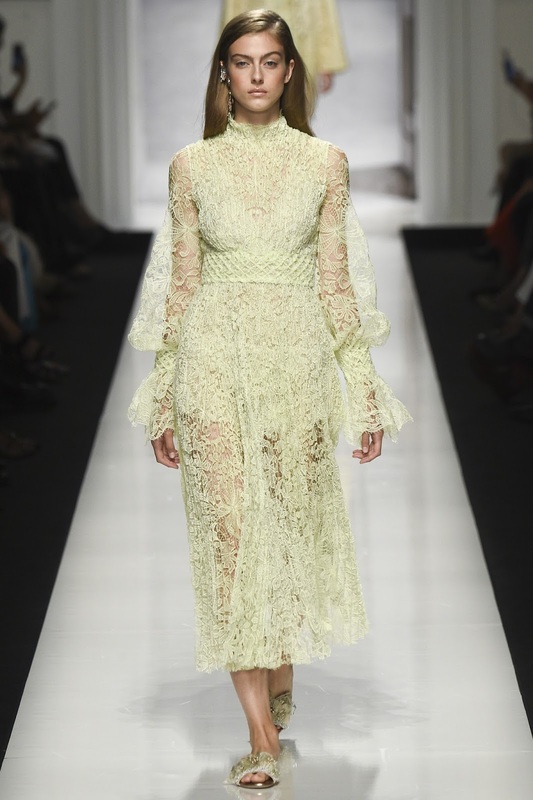 Eyelet lace and broderie anglaise added a lightness which Molinari mixed with raffia or straw accessories for texture. We didn't want to like this collection, but we did. Versace eschewed the glamour of red carpet dressing and focused on relaxed dresses and separates in a deep, rich palette. They showed parkas, leggings and t-shirts threaded with drawstrings or held together by snap closures in technical fabrics. Perhaps taking its inspiration from the recently-completed Rio Olympics, Max Mara's show was athleisure with a tropical twist - what we would call Tropical Modern. The House cited the works of Italian-born architect Lina Bo Bardi who worked out of Brazil in the 1960s as its inspiration and who proved to be the perfect embodiment of Italy and Brazil. 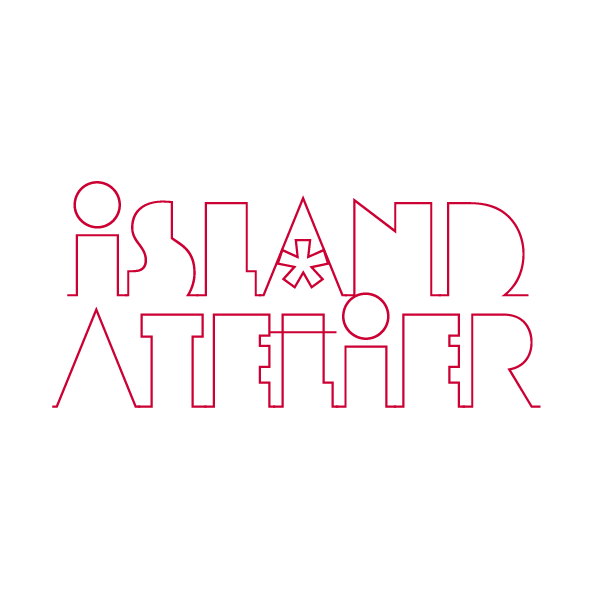 The models appeared from behind a brutalist concrete wall and traversed a long runway interspersed with greenery. The clothes consisted of coats, parkas and hooded jackets, jumpsuits made of technical fabric in a lush tropical prints often with grass-like 3-D texture. For spring, Prada was a retrospective of sorts as designer Miuccia Prada took comfort in past while referencing elegance in the present. She showed chinoiserie pyjama suits, art deco prints and an abundance of ostrich and marabou feathers that were carefully chosen to add contrast. 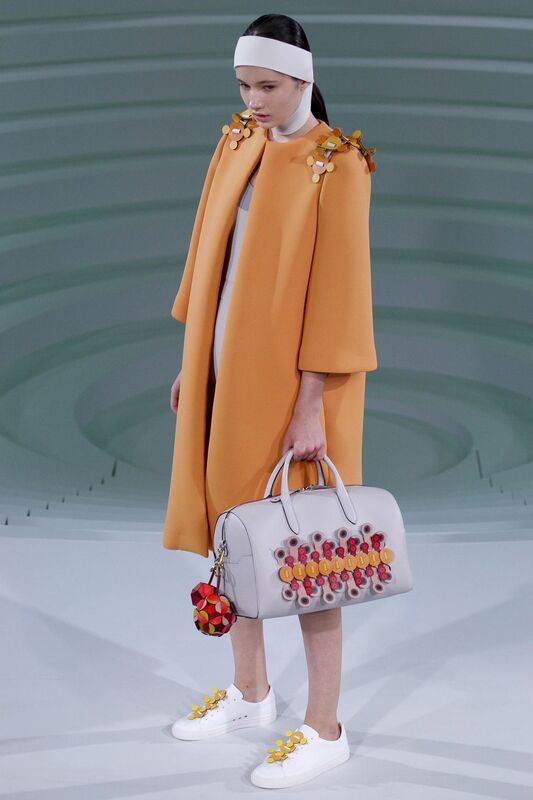 The delicate material showed up on sleeves, shoes and even handbags. Tropical Storm Karl has thrown our posting schedule off by more than a day, so it felt appropriate to mark our return with a look at what the storm's namesake has been up to. People have been disparaging Karl Lagerfeld's Chanel recently, but we loved the Fendi show which no doubt benefitted from his continued collaboration with co-designer Silvia Venturing. They showed striped crop-tops, apron dresses that were fastened together with bows, baroque brocades and lingerie silks. Enlarged and abstracted Pucci prints in eye-wateringly bright colours and softly-draped jersey dresses ensured an impressive collection from creative director Massimo Georgette. A textural show from No. 21's designer Alessandro Dell’Acqua featuring asymmetrical net or patchwork hems, pompons and fringe, macramé dresses, sequinned tube skirts and feather-trimmed tops. We loved the bow-topped pumps worn with sheer socks. 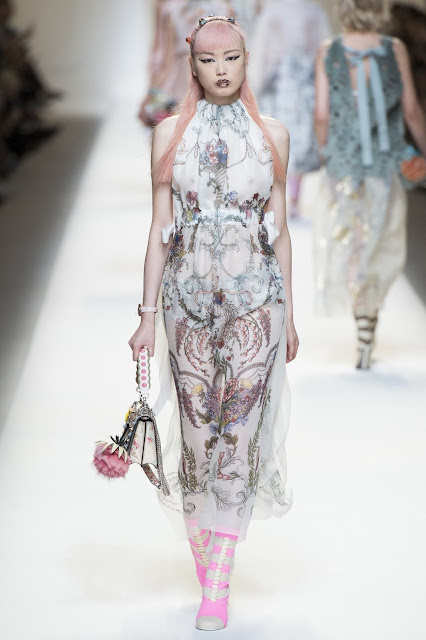 A stunning show from Alessandro Michele at Gucci that spanned decades. With each look our eyes popped more: from a fisherman's hat in brocade with floral accents, to a coat covered in glittery tiered fringe or a gossamer chiffon dress covered with zigzag sparkles, the show was full of unrestrained exuberance and we can look forward to seeing these garments turn up in editorials and on the red carpet. 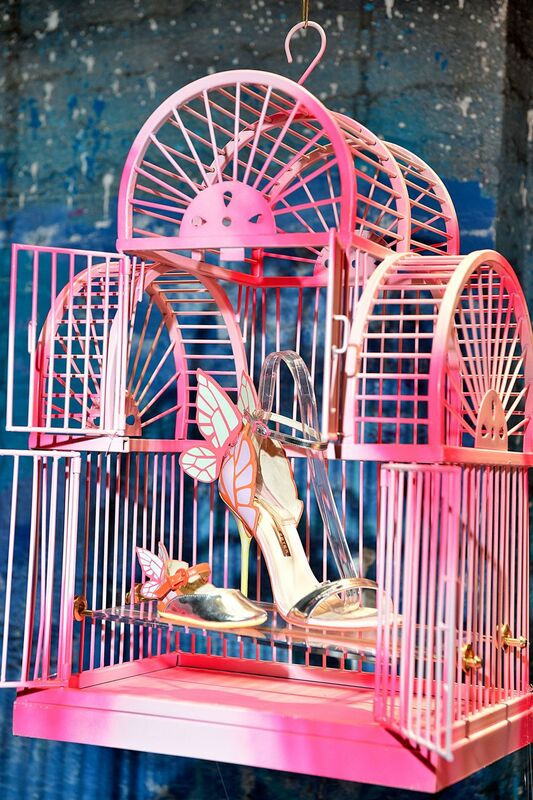 We're not sure we were on board with the models in cages, but even the hardest of hearts would find it impossible not to melt with the mummy-and-me versions of these shoes from Sophia Webster. In the 2000s, Joseph were famous for their impeccably cut trousers which had a cult following, but the longevity of a House cannot rely on one item alone. Designer Louise Trotter shows that she understands that premise, and for Spring we see a modern and directional look which is a far cry from the conservative practicality of the past. Instead Trotter, like many of the designers we have seen this season, appeared fixated on the deconstruction of the clothes and a louche sensibility. Traditional shirting was given a new spin with drawstring sleeves and the absence of collars, buttons and seams were skewed and waistlines obliterated. Clothes appeared to hang off the body, with jackets and coats slung in a nonchalant fashion across shoulders. The show ended with knit and sportswear-inspired pieces that had been excessively layered and fringed. For Spring, Hindmarch was inspired by art and geometry and as a result, the starting point for her show entitled Curculus was an impressive sunken, circular arena. The futuristic set was the perfect setting for streamlined clothes that included neoprene coats in lush colours. The clothes, bags and shoes featured complex, geometric leather shapes in contrasting colours created by cutting-edge technology. Hindmarch showed a variety of flat shoes including sneakers, neoprene sock booties and slides in leather and faux fur, the latter of which added little levity to proceedings as they featured smiley faces or fried eggs. These clothes are a little more extreme than we usually feature here, but there was something about Han Wen's Spring show that we loved. Perhaps it was the intricacy of the detailing that really appealed to us. 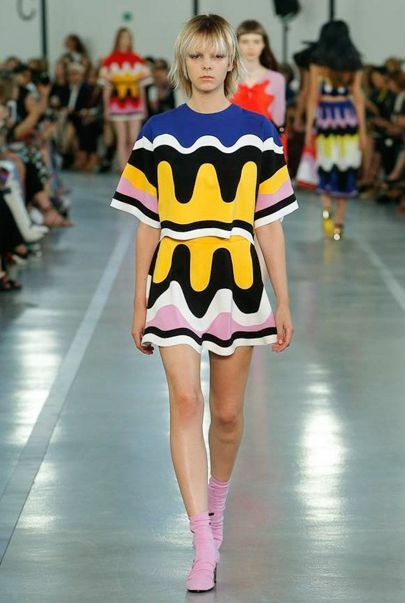 We love London Fashion Week simply for the lighthearted whimsy that you often see on the catwalk. Whimsy is certainly a term that perfectly describes this collection from Ana Ljubinkovic which saw a bevy of models decked out in ice cream hued outfits. Classic good taste is something that always Springs to mind when we think of a Jasper Conran collection. For Spring 2017, we saw beautifully cut dresses and skirts in mid lengths, all very tastefully done. Jackets and skirts featured a contrasting seaming detail or were rendered in a large painterly check pattern. Conran mainly designed separates this season and cropped sweaters and tops were paired with precision-pleated skirts. The easing of his structured silhouette only came towards the end of the show with flowing, striped caftan-like gowns and dresses in horizontal and vertical stripes. We aren't familiar with designer Katie Roberts-Wood but her monochromatic show for Spring 2017 really appealed to us. 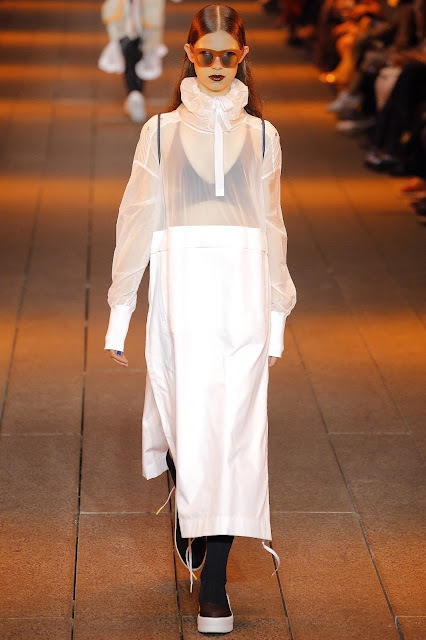 The collection was a nod to the designer’s medical background (she studied medicine for a decade before enrolling in the master’s program at Royal College of Art to study womenswear) with the airy silk organza designed to mimic the transparent nature of radiographs and x-rays. The minimal designs featured clever details such as frills and ruffles along seams of trousers and dresses and oversized bows. Roberts-Wood uses an innovative technique that braids panels of organza together. The result is a completely unstitched garment with voluminous ruffles. Our favourite look? A textural navy dress comprising entirely of tulle ruffles over a sheer slip. There was a sweetness about the clothes shown at Emilia Wickstead's presentation. 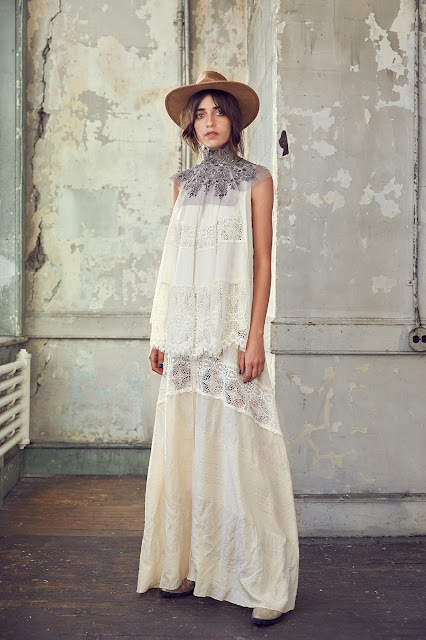 Lightly sprigged with flowers and fashioned in soft pastels, the dresses were occasionally overlaid with geometrically patterned lace evocative of the Edwardian period, while her trousers were high-waisted and fluid. There was nothing flashy or outlandish about these clothes as they were intended to appeal to a certain sort of retro-modernity. 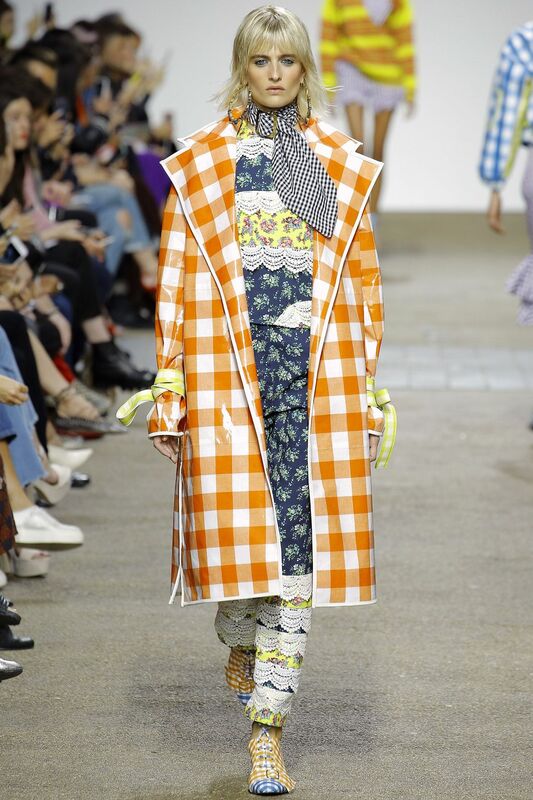 A feeling of nostalgia permeated Henry Holland's show which featured a decade of self-references in recognition of the House's tenth anniversary. Visually busy, the clothes included tiered, ruffled gingham or floral prints often layered over mesh netting. Holland closed the show with a herd of models wearing updated versions of his iconic pun t-shirts which were paired with mirrored sunglasses and oversized earrings. The collection, which marked Molly Goddard's first proper runway show, was said to be about people who live for the weekend and, in particular, Goddard looked at 1990s rave culture in New York as documented by Nick Waplington for inspiration. She showed lots of gathers, frills and sheer tulle which she combined to create voluminous dresses as well as her signature smocking in gingham check. 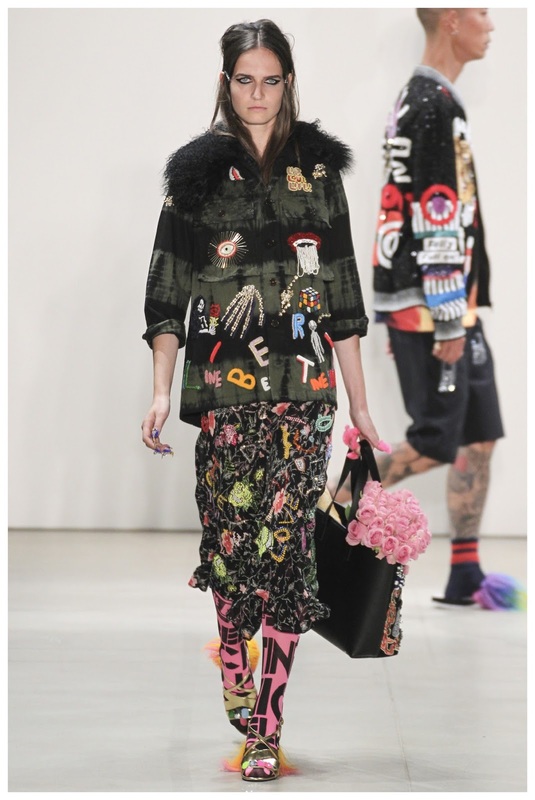 These items were paired with simple knits in rainbow stripes and photo print tees with cheeky (pun intended) images. 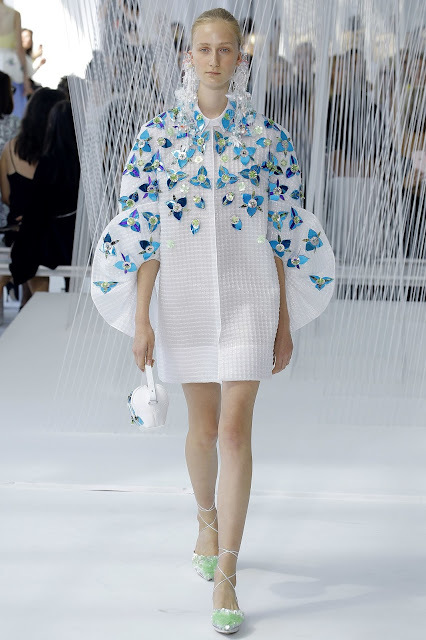 Other designers may come and go, but our love for Delpozo remains constant. We wait each season for the proverbial bubble to burst, but have yet to be disappointed. For Spring 2017 , creative director Josef Font took his inspiration from the Spanish Impressionist painter Joaquín Corolla, known as the master of light, and contemporary artist Soo Sunny Park. Once again, structure was key and Font showed exaggerated silhouettes and cinched-in waists in bright, metallic jacquard florals. Every look featured at least one element that bowed away from the body: curving sleeves, full skirts or collarless lapels. For texture, in addition to his signature embellishments, there was a delicate spiderweb knit. We thought there was a bit of a Korean influence and a stunning floor-length gown in organza stripe echoed the chima jeogori of the Hanbok. Designer Alice Bendet was inspired by two seemingly disparate elements - Italy and tarot cards - for this collection that combines the romance of one (in particular the Gardens of Bomarzo) with the mysticism of the other. The clothes were heavily embroidered with garden scenes, flowers and butterflies. Bennett also used the opportunity to launch her eyewear line and it provided the perfect accompaniment to her clothes. 3.1 Phillip Lim took inspiration from the romanticism of Victorian bathing suits and the soul of 1950s Nashville. Like the setting, the clothes were strewn with flowers and an acid-washed denim showed up on jeans and skirts. The bralette, a trend that has been turning up often this season, was layered under trench coats and bomber jackets. Jack McCollough and Lazaro Hernandez travelled the world to discover unique and little-known techniques to incorporate into their collection for Spring: dresses were handwoven from leather, tops made from ostrich feathers glued onto long strips of fabric and a pleating technique created voluminous skirts. The pair concentrated on bright stripes in primary colours. T-shirts featured Bernini sculptures or random images of McCollough's fist. Once again travel was the inspiration for a Tory Burch collection. For Spring 2017, Burch has mixed prep with California cool to give what was being termed as "New Classic Americana". The show opened with several nautical pieces featuring clothes covered in a sailboat and schooner print or rope motifs and featured bags with rope woven through the handles. The second half of the show saw clothes with an eclectic print. The Bohemian vibe included beaded prairie skirts and batik-printed twill. The disparate looks were brought together in the last outfit which somehow married the two aesthetics. Following Peter Copping's departure several weeks ago, Oscar de la Renta's Spring collection was designed by the ten member studio team. Although a placeholder collection, we still thought it was a worthwhile effort and a noteworthy collection. If you think the name Vera Wang is synonymous with beautiful wedding dresses, you should be prepared to have all of your preconceptions skewered with her Spring 2017 show. The clothes had an edgy feel as the models teetered down the runway in buckled platform booties. The largely monochromatic collection featured clothes that were both deconstructed and distorted as proportions were altered to create elongated shapes and silhouettes in a way that may be difficult for her die-hard fans to appreciate. We liked the sheer, georgette cocktail dresses and separates that were beaded with pearls and featured a structured peplum. Who says reinvention is a bad thing? We certainly celebrate her for trying something different. Always one of the more creative shows at Fashion Week (last season the stage was outfitted to resemble a Victorian graveyard), Thom Browne once again did not disappoint with his Spring 2017 show. Browne took his inspiration from Slim Aarons’ classic 1955 image of socialite CZ Guest poolside in Palm Beach entitled “The Good Life”. The models initially entered what appeared to be an empty swimming pool wearing loose caftans and bathing caps which were removed to reveal the outfits underneath. It took us a few moments to realise that what we were looking at were actually trompe l'oeil effects superimposed on a single garment with a zipper running up the back for easy access. The clothes appeared to be tailored but the effect was actually created by the clever use of seaming and colour-blocking. The show ended with the models shedding their garments (which were then collected by a gaggle of male models dressed as birds) to reveal swimsuits in Browne's signature red, white and blue stripe and assuming lounging positions poolside. Browne's accessories were also noteworthy. Hector, his dog, returned in two iterations: as a bag in patchwork floral or gingham check and as some form of 'goddess' with a mirrored disco ball hat designed by renowned milliner Stephen Jones. Don't overthink it, it worked. In keeping with the water theme, the sunglasses worn by the models featured kissing fish or a whale silhouette and the intentionally mismatched shoes sported a wedge heel with nautical motifs such as a spouting whale, an anchor or a sailboat. We sometimes look at outlandish fashion collections with more than a touch of scepticism because often the designers are presenting clothes simply for the purpose of setting them apart from the pack or generating column inches (we're looking at you Gypsy Sport). In the case of Libertine's Spring collection however, we actually liked most of the more avant-garde offerings. The collection was graphic-heavy and we were particularly fond of the icon print that featured actors and royalty as well as what appeared to be pets and friends. As always there was a lot to take in in terms of pattern, colour and texture, but the pieces were beautiful and well-cut (some could even be called chic and conservative if taken on their own), colourful and fun. 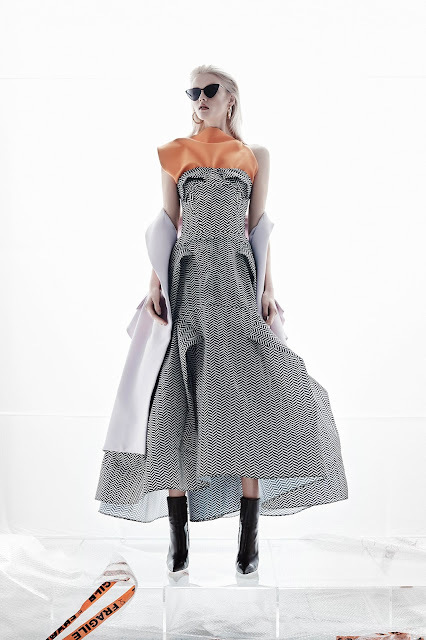 DKNY creative directors Maxwell Osborne and Dao-Yi Chow play with proportion here as well as deconstruction. Sleeves were overextended, tops extra long, leg wear pulled up over the thigh. The collection was heavy on the activewear and we particularly liked the raincoats made out of a semi-transparent polyurethane. There was also some tailoring, but the pinstriped suiting was save from being too conservative with the addition of fringe. You can almost smell the citrus grove with this bright and colourful collection from Altuzarra. A little derivative of Dolce e Gabanna's perennial Mediterranean love affair, you can't fault him for wanting to capture a little bit of sunny optimism for Spring. As a result, the collection is unabashedly optimistic. Inspiration was loosely taken from the movie Wild at Heart and in addition to the sunny, yellow lemons, Altuzarra featured a bright cherry print on a blue background while snakeskin prints added a little bit of toughness to the feminine silhouette of tight pencil or flounced skirts and cinched in waists. A stunning collection fit for a diva from Jenny Packham so it was no coincidence that the thirty-one looks that walked the runway were inspired by thirty-one different women including Brigitte Bardot, Iman and Florence Welch. Packham showed beautiful, embellished gowns and that were largely floor-length. The rare exception was a floaty pleated and caped mini dress which featured a Guggenheim-inspired graphic and a beautifully embroidered lace short separates pictured above. Although it feels almost sacrilegious to say, we feel we're supposed to like Jason Wu more than we actually do in most instances. His line for Spring was a prime example: the show got off to a shaky start, but glimpses of real charm showed through later with the tulle dresses that were outlined in neon or covered with floral appliqués. Borderline too twee for us, Rebecca Taylor adds some toughness to her largely pastel, Victorian-inspired collection with the addition of distressed denim and chunky-soled sandals. Novis' designer Jordana Warmflash is all about texture for Spring and showed hand-crocheted knits and soft jacquards in geometric prints. Karen Walker took Babou, the ocelot Salvador Dalí kept as a pet, as the starting point for her Spring collection which also saw references to the birds of the South American jungle from which the ocelot hails. 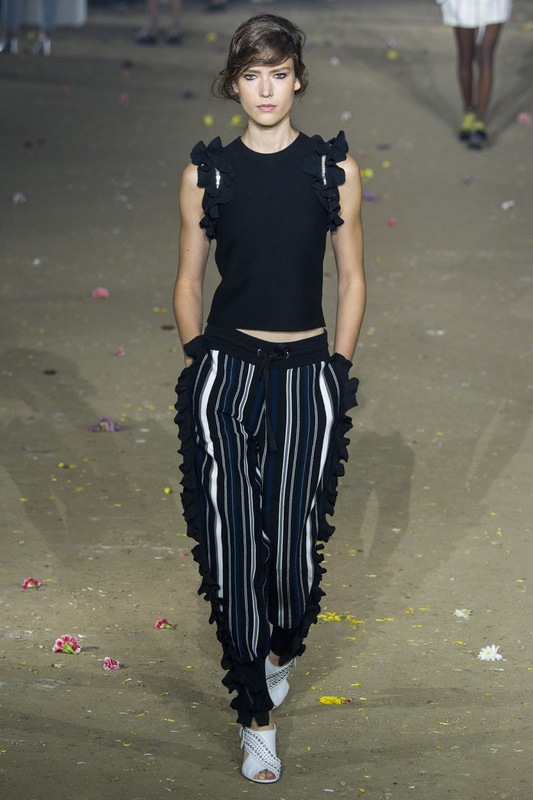 Walker puts a frill on everything: from tops and skirts to the most gorgeous chunky-heeled loafers and shoes. Dresses were made up in sheer fabrics with delicate pintucking. Sleeves were voluminous and ruffles abounded but Walker also included tailored and more masculine coordinated pieces for balance. There were no innovations with her eyewear this season, although several classic shapes made a return. Gary Graham's Spring show featured a jumble of influences and textures that somehow worked together. A floor-length lace gown that was layered over floral lining perfectly encapsulated the mood of this collection which included a mix of florals and lace, deconstructed denim pieces and delicate embroidery. 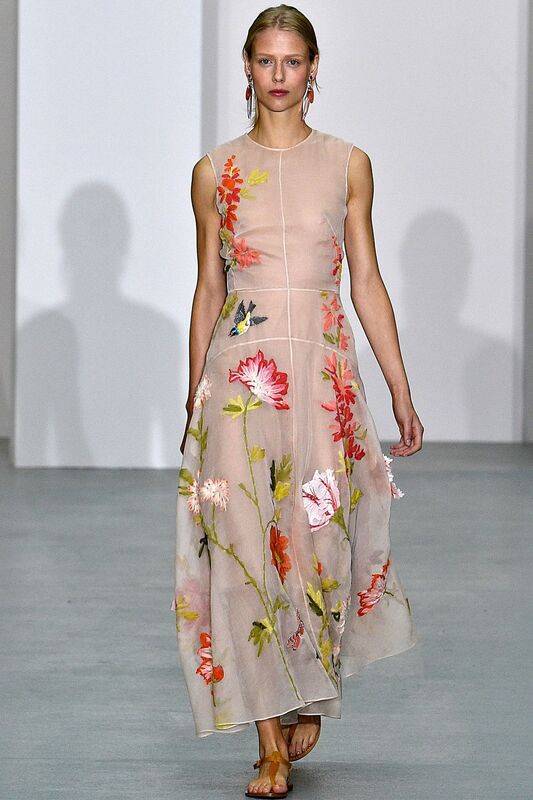 Zimmermann's modern Prairie girl wore ultra-feminine looks for Spring. Asymmetry was writ large from the draping on tops - one shoulder was often left exposed while the other covered - to frills that swooped and skimmed the body and uneven hems. The lightness of the sheer fabric and prettiness of the florals were grounded by booties and boots that featured intricate lacing. Similar corsetry turned up on tops and bustiers and, as a counterpoint, suits and coats were rendered in windowpane check. With visions of the seaside, waves and the beach, Valentino's diffusion line Red Valentino is a visually light Spring collection peppered with sunshine, sandy shores and birds in flight. We liked the red striped awning print, loosely woven knitwear, pleated mid-length skirts, pretty broderie anglaise and lace dresses and blouses. Their take bomber jacket was rendered in crepe de Chine and following on from last season, pretty scalloped shorts and dresses returned. In terms of obvious trends, a flamingo print shows up on a few pieces and when taken in conjunction with Haus Alkire's Spring collection, may be an indication that it's time for these birds to come into their own. It is already notable that several collections have been playing with proportion this season, and Red Valentino is no exception. Their most striking take: degrade denim jeans and overalls that had not just wide-legs but ones that were overly exaggerated and pooling on the ground. We're kicking off our double distillation of fashion month with a look at a few New York collections before the runway shows overwhelm us. First up, Hervé Léger by Max Azria who have kept the banded and corseted history of the line but attempted to soften the theme slightly with the addition of ultra-feminine frills, texture and balletic looks in a palette predominantly made up of white, cream, pink and pale blue. 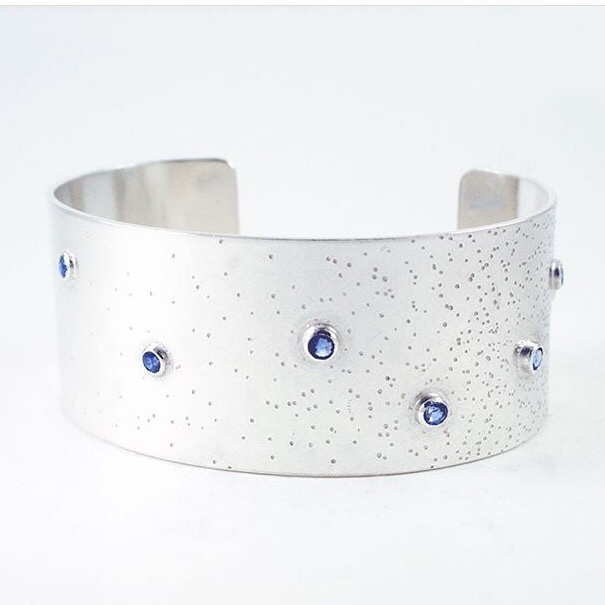 This bespoke silver and blue sapphire bracelet from Bermudian designer Rebecca Little is scattered with gemstones from Sri Lanka. 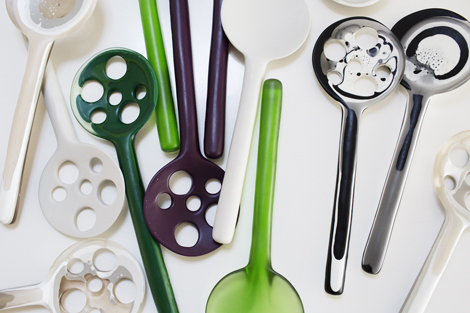 These handmade resin salad servers from Dinosaur Designs mimic the simple, botanical shapes of lotus seed pods. Louise Olsen and Stephen Ormandy of Dinosaur Designs have a background in jewellery-making and resin is a favourite material of both. The semi-transparent servers are made by hand in Australia and as such, each piece is uniquely individual. 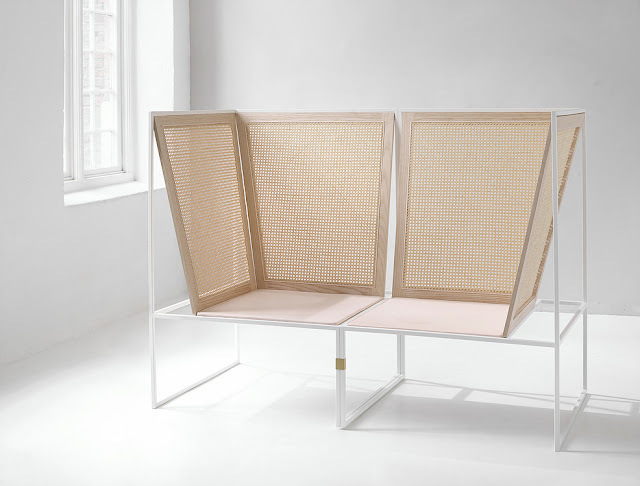 This very modern take on cane furniture is the white version of the collection entitled #80 Concept by new furniture design company Aggestrup. Modular in form, the collection consists of a sofa and and individual seating that are designed to embrace the sitter while providing a feeling of privacy. The seats have a thin pad while the metal legs are banded together by a copper brace. The flexibility of the furniture and the number of layouts that are possible, mean that the furniture is ideal for hotels, receptions and lounge areas. Aluminium seems to be the material of choice of the moment. Following on from this post, here we have Allumette, an LED floor lamp designed by Knauf and Brown as an exploration of monolith forms. 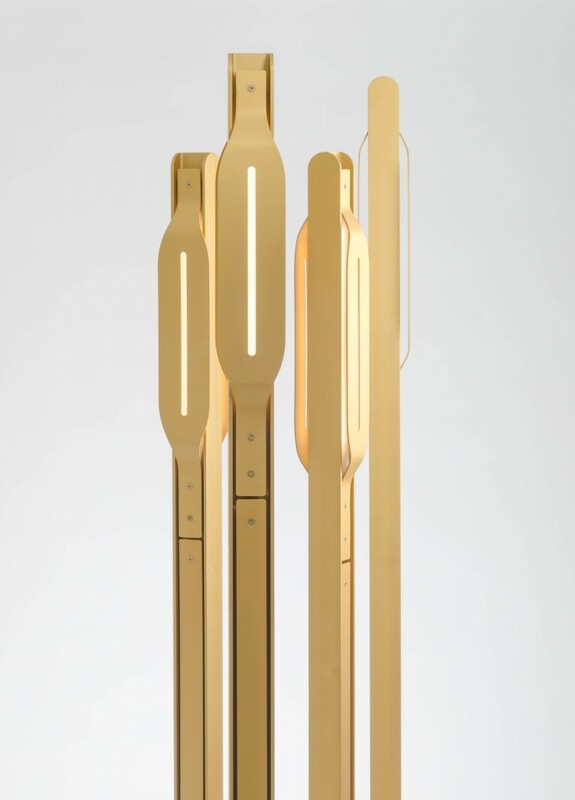 The name of the lamp is a play on the French word for a match but also references the core material, aluminium. The lamp is created around a structural form and has two recessed panels that act as reflectors and allow the internal light to be diffused. Designed by Marc Venot and made from European Beech wood with a matt lacquer finish, is this curved chair and table which are designed to look like the head and body of an elephant. 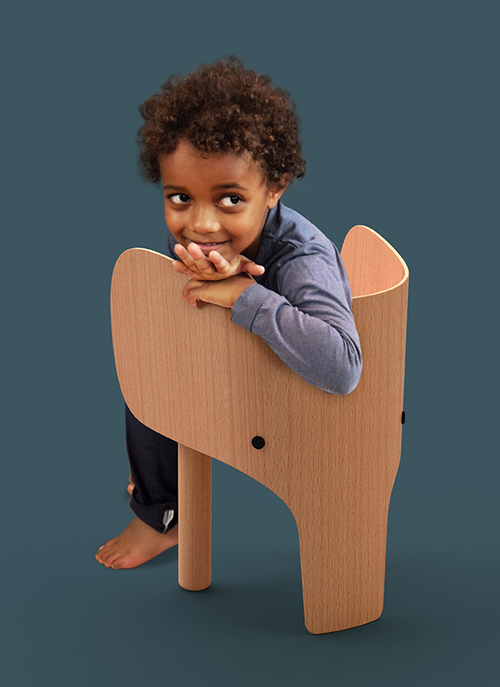 The table and chairs are intended to be used by children between the ages of 3 to 10. These have been on our radar for a while, mainly because we think the espadrille is the perfect summer shoe. This collaboration elevates the standard fare with the addition of embellishments by the South African jewellery designers Pichulik. Made in conjunction with Espadril SA, the espadrilles come in yellow, black, white to which gold and rope trim - signature Pichulik details - have been added. As part of Pichulik's Nolita collection, the shoes are intended to compliment the largely monochromatic clothing range. Pichulik accessories are designed and crafted in Cape Town while Espadril SA, the shoe brand founded by South African Rizqah Isaacs and Spaniard Patricia Terre, use imported Spanish cotton.